Floral water of lavender, mint, savory and melangolo bitter essential oil. Floral water of lavender, mint, savory and melangolo bitter essential oil. 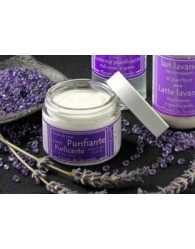 The union of antiseptic and healing properties of lavender, stimulating and refreshing mint, antimicrobial properties of savory, and action on inflamed pores of bitter melangolo, act effectively on skin imperfections of a mixed trend. DAB with a WAD on face and neck. It ‘s a very valuable product. I use it every night after my make-up. My combination skin finds benefits. The skin is clean, the pores are not dilated. Also this product as all their products is certified VeganOK. Its function is similar to that of the tonic. In fact I just use instead of tonic.